A paperback copy of this liturgy from the Stowe Missal with introduction and rubrics by Fr Michael Wood is now on sale from Saint Bride Hermitage. Available for purchase here . The Liturgy of Saint John the Divine as used in the British Isles was well known on the Continent for what they thought were the quaint eccentricities – “British” that they saw in it. 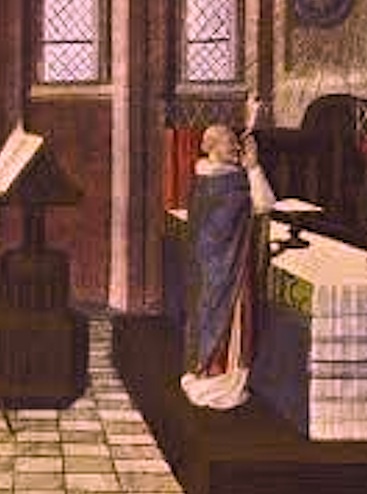 To us today it looks like any Celtic liturgy – but there are differences. What we have (which is translated – and has very minor additions) as being peculiarly appropriate to the secular – pagan society surrounding us – rather than the later triumphalist liturgies. It is authentic – we know that the original book is there for scrutiny – and it has been scrutinised. It might even be possible to take the x-rays and re-construct the liturgy as it was before the insertion of the Gregorian canon. That gives it an authority and an unarguable Orthodox authenticity. The church of the period had no candles on the Altar, neither had it a crucifix on the Altar. 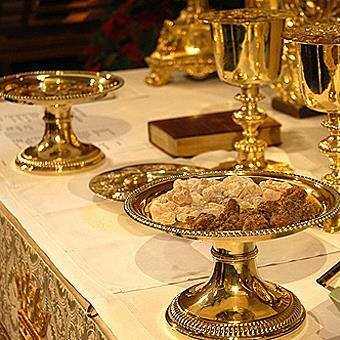 Nothing was permitted on the Altar save the Book, linens, Chalice and Paten. Candles stood on the floor beside the Altar or in niches above to each side. The Crucifix was on the wall or ledge behind the Altar. Vestments progressed from being almost completely plain to being embroidered towards the end of the millennium. The colour sequence ought to be the early Sarum sequence for we know that Sarum borrowed heavily from this Liturgy and the church practices which preceded the Norman invasion. A Paten of the style used at the time of this Liturgy.